There are two possible ways to purchase a business; one way is through the acquisition of the company’s assets and the other is effected by buying the company’s shares or capital stock. Asset acquisitions occur when the buyer purchases all of the company’s tangible and intangible assets from the seller. Tangible assets usually include everything from the company’s accounts receivable, inventory, furniture and fixtures, customer lists, logos, etc. Intangible assets would include things like proprietary technology and know-how, etc. In certain situations, buyers may also assume certain liabilities of the company to be acquired. In yet other circumstances, the acquirer may buy only selected assets. A stock transaction occurs when the buyer simply purchases the capital stock or shares of the company for sale; in effect, eliminating the transfer of title of all the assets within the company. In this type of transaction, the buyer also “acquires” all of the debts and liabilities of the company. Tax considerations are often times one of the major determinants in deciding which type of sale is used. When an asset acquisition takes place, the buyer steps-up the tax basis of the assets acquired, which results in increased depreciation and lower taxable income in future periods. In an asset acquisition there may be higher taxes for the seller because the company will have pay tax on the gain from the sale of the assets. The shareholders may also have to pay taxes on their individual gains when funds are distributed from the company. Usually, a good tax advisor can help the selling company and the shareholders to mitigate the taxes related to an asset transaction. Sometimes, these tax considerations complicate the negotiations, but a good M&A advisor should be able develop a fair way to resolve the issue(s). From a liability standpoint, the acquisition of the company’s capital stock or shares increases the risk for the buyer because all actual or potential liabilities with regard to the selling company are acquired with the capital stock. Consequently, the due diligence process is often times more meticulous in a stock purchase due to these assumed liabilities and the enhanced risk of the transaction. This risk to the buyer can be mitigated by transferring liability back to the seller in the purchase agreement via representations and warranties. The buyer may also require a larger escrow and a longer time period if there are real or perceived risks related to undisclosed or even unknown liabilities. Acquisitions can be a very productive way to grow a company and to build shareholder value. More specifically, companies make acquisitions for either offensive or defensive reasons. 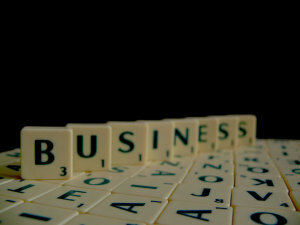 The key to leveraging acquisitions into a competitive advantage requires the buyer to focus on four specific capabilities, which include (i) carefully developing M&A objectives, (ii) managing your reputation as an acquirer, (iii) maintaining the strategic vision of the target, the buying company, and the transaction, and (iv) managing the integration, especially the expected synergies over time. M&A objectives need to be clearly outlined. In other words, what is the purpose of the acquisition? 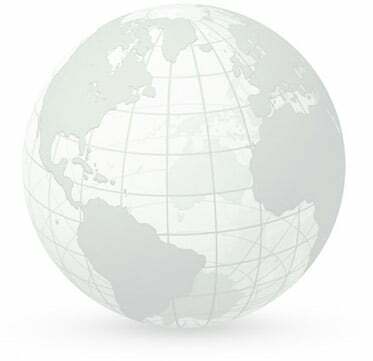 A company may make an acquisition to bolster its client list or cover a broader or new geography. Similarly, a company may buy another company for defensive reasons, for example, they may not want a competitor to have the benefit of acquiring the target company. In order to develop proper M&A objectives, a company must go far beyond any initial growth strategy and get to the core of how a potential target will add value. This involves considering the unique characteristics of their own business, their customers, their market, etc. Many times, companies don’t spend enough time developing their M&A objectives. If one is not careful in this analysis, the end result is wasted time, effort, and sometimes the loss of large amounts of money. It is imperative that an acquirer manage its reputation as a buyer by having positive interactions with sellers. 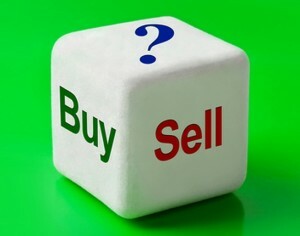 A buyer should always deal with targets fairly, and to the extent possible, in a transparent fashion. The acquiring company should communicate how the target will be assimilated so that the seller understands how it would fit into the bigger, long-term strategy of the buyer. In most cases, the buyer will not, and does not need to, divulge all of its strategies, but sellers like to understand how their companies will add value to the acquirer in the future. When buyers share their vision, sellers usually contribute to that discussion, which only adds more value. By dealing with targets in this way, the buyer builds a positive reputation in the marketplace and ends up by attracting more and better targets over the long term. Some of the world’s largest corporations have done this well and the end result is that even small targets perceive them as attractive buyers. “Attractive buyers” are able to complete more and better transactions whereas buyers that breach confidentiality agreements or do not operate in a professional and ethical way usually find themselves not being able to acquire any companies. It’s vital that the buyer maintain and/or revise, over time, its strategic vision of itself, the target, and the projected synergies in order to create a truly successful transaction. For many buyers, this connection gets lost during the due diligence phase. Smart buyers will complete not only the standard due diligence, but also strategic due diligence, which will test the hypothesis that the target is in fact a synergistic acquisition. This additional diligence will help insure the long term success of the transaction. Finally, it’s important for the buyer to keep reassessing the acquisition over the long term. The one constant of every business is that things keep changing. Therefore, the buyer needs to keep assessing the synergies between itself and the acquired company. Synergies that were apparent at the closing of the transaction may nor may not be available 12 or 24 months later. Like all parts of business, value will be created or destroyed as the buyer and seller continue to integrate their businesses over the longer term. If this integration process is managed properly and reassessed regularly, value will be maximized. In the end, acquisitions can help companies grow and prosper, but only if the M&A process and the subsequent integration are conducted diligently and properly. If done correctly, acquisitions can bolster a company’s offensive position so that it can build shareholder value or enable it to build adequate defenses to protect shareholder value. In most cases, a professional M&A advisor can help guide this process to a successful transaction. 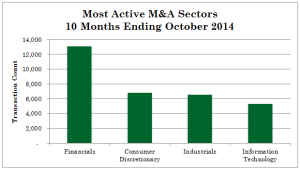 Worldwide, across all sectors, M&A deal volume, for the ten months ending October 2014, has been robust. The four most active sectors in M&A this year have been Financials, Consumer Discretionary, Industrials, and Information Technology. The following chart shows the transaction volume of these four sectors. Private Equity buyers have a reported US$1 trillion to invest and large corporates are also looking to put their record cash balances to work. With debt financing readily accessible at favorable rates, leveraging acquisitions has proven to be beneficial for some acquirers. 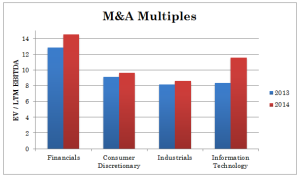 These factors are leading to increased demand and higher M&A multiples as demonstrated by the following chart. There are many steps that need to be taken when organizing the acquisition of a company, division, or product line. 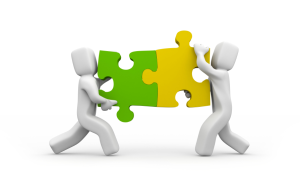 Initially, an acquisition strategy needs to be developed. An acquisition strategy is essentially a business plan which acts as a road map for completing a successful acquisition. The objectives of the acquisition search need to be clarified, and potentially, written down. Another important aspect of this plan is to detail the guidelines to be used when screening acquisition candidates. One does not want to get caught wasting time on a target when the probability of closing is too small or on a target that will not add value in the future. A defined acquisition strategy will give the buyer a method to evaluate potential acquisition candidates relative to the stated objectives of making such an acquisition. Another crucial aspect of a well-defined acquisition strategy is establishing an acquisition team. An acquisition team must have their responsibilities and authorities clearly mapped out. It is also important that different parts of the company are represented within the acquisition team since they may have conflicting interests within the organization. Typically, the owner or CEO is responsible for selecting team members and being aware of any conflict of interests that may exist between parts of the company. For example, the sales people may be focused on selling low margin products whereas finance may only want to acquire targets with high gross margins. The acquisition team should be comprised of product specialists, finance, legal, marketing, etc. so that the target can be understood at multiple levels. Like any team, the CEO needs to guide the team members to insure that objectives are met, conflicts are minimized, and the resulting acquisition is successful. Every company is unique in its own way and management knows better than anyone what makes their company different. It is important to understand current market share, manufacturing costs, whether or not you are on the low or high end of the market, where working capital is being utilized, how much marketing is being done, etc. By analyzing these aspects, the buyer will be able to develop an acquisition strategy that compliments the buying company’s strengths and mitigates its weaknesses.